Hugo? This name or last name is familiar to me. Isn’t it for you? Was there someone named Victor Hugo or the less known Jean Hugo? Yes indeed, today you’re going to see paintings, drawing of these two talented misters. 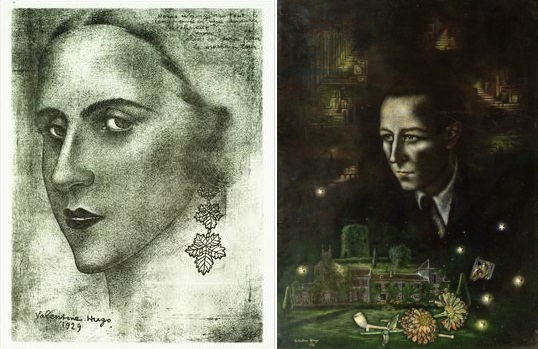 There’s not going to be any interesting facts or subjects about these two artists, but I will do my best to describe the feelings they put into their paintings and drawings. Victor or Jean Hugo have many talented individuals in their family tree. For exampleValentine Hugo (ex wife) was also a French artist and she made a portrait of Paul Deharme and Lise Deharme. Jean Hugo was born in Paris (1894-1984), he was an illustrator, author, theater designer and painter. 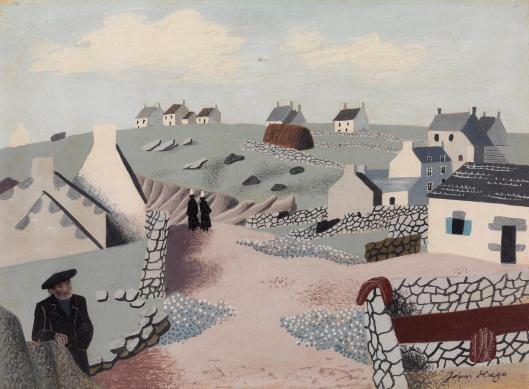 Hugo is predominantly known for his sketches and oil or gouache paintings, which are often executed in small formats. 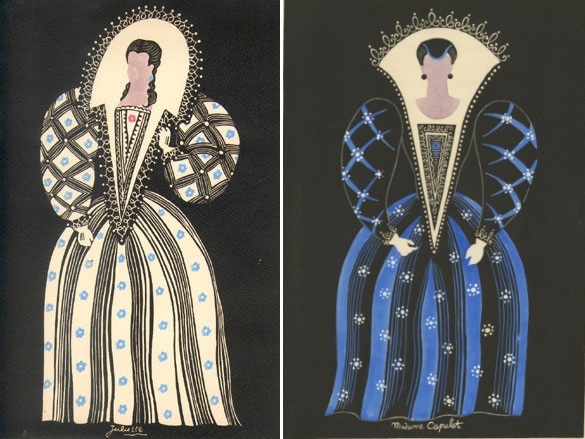 He also made illustration for known books like for example “Shakespeare: Roméo et Juliette, Au Sans Pareil, 1926 “, “Jean Cocteau: Orphée, Stock, 1927”, etc. Jean Hugo was the great-grandson of the poet, playwright, novelist, essayist, visual artist, statesman, human rights activist and exponent of the Romantic movement in France, Victor Hugo. Victor Hugo was a French poet, novelist, and dramatist of the Romantic movement. For the record, Victor Hugo wrote the novel ‘Les Misérables’ and it’s about social misery and injustice at the early 1830s. He did not only have a pen and ink in his hands, but brushes and ink to fill the white papers. 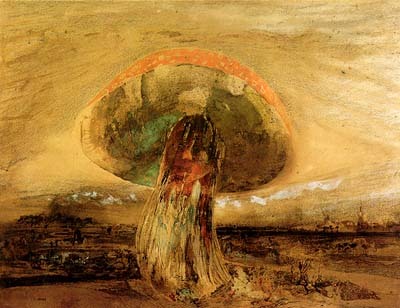 With that I mean he also painted really abstract, mysterious and evocative drawings and paintings. I think that Jean Hugo was more fascinated about life and their colors, Victor was a busy man who couldn’t hold his ideas and he had to reflect them everywhere. In words or in lines, no matter what, it just had to be placed somewhere. When you look at the paintings of Jean Hugo, they’re quite happy for some reason, he reflects life with color and that is a huge opposite with Victor Hugo’s paintings. Victor’s happiness embraces the sombre colors and that includes dark gray or black colors. 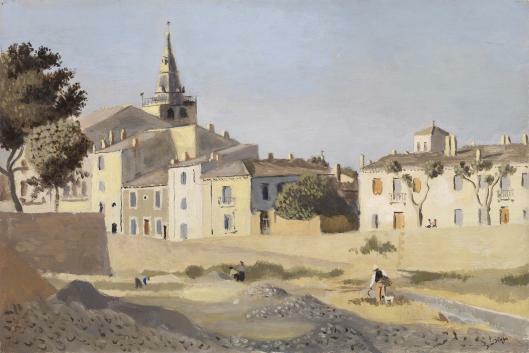 Jean Hugo, Lunel Seen from the Canal (1942). 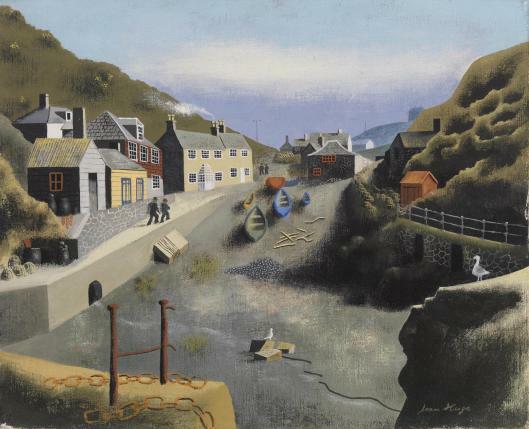 Jean Hugo, Mullion Cove (1933). 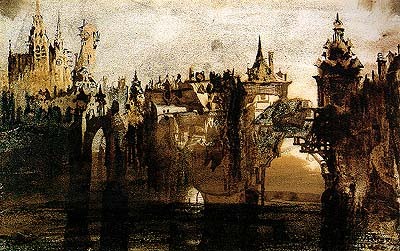 Victor Hugo, Town with tumbledown bridge (1847).